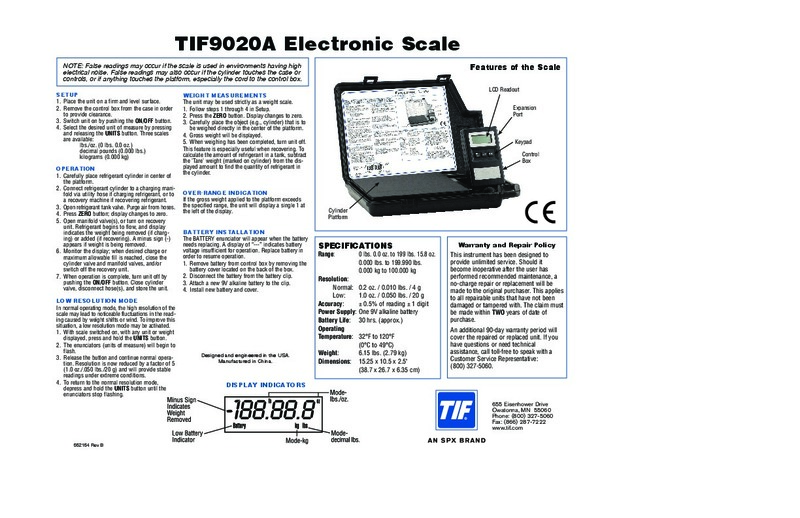 TIF9020A Electronic Scale NOTE: False readings may occur if the scale is used in environments having high electrical noise. False readings may also occur if the cylinder touches the case or controls, or if anything touches the platform, especially the cord to the control box. SETUP 1. Place the unit on a firm and level surface. 2. Remove the control box from the case in order to provide clearance. 3. Switch unit on by pushing the ON/OFF button. 4. Select the desired unit of measure by pressing and releasing the UNITS button. Three scales are available: lbs./oz. (0 lbs. 0.0 oz.) decimal pounds (0.000 lbs.) kilograms (0.000 kg) OPERATION 1. Carefully place refrigerant cylinder in center of the platform. 2. Connect refrigerant cylinder to a charging manifold via utility hose if charging refrigerant, or to a recovery machine if recovering refrigerant. 3. Open refrigerant tank valve. Purge air from hoses. 4. Press ZERO button; display changes to zero. 5. Open manifold valve(s), or turn on recovery unit. Refrigerant begins to flow, and display indicates the weight being removed (if charging) or added (if recovering). A minus sign (-) appears if weight is being removed. 6. Monitor the display; when desired charge or maximum allowable fill is reached, close the cylinder valve and manifold valves, and/or switch off the recovery unit. 7. When operation is complete, turn unit off by pushing the ON/OFF button. Close cylinder valve, disconnect hose(s), and store the unit. LOW RESOLUTION MODE In normal operating mode, the high resolution of the scale may lead to noticeable fluctuations in the reading caused by weight shifts or wind. To improve this situation, a low resolution mode may be activated. 1. With scale switched on, with any unit or weight displayed, press and hold the UNITS button. 2. The enunciators (units of measure) will begin to flash. 3. Release the button and continue normal operation. Resolution is now reduced by a factor of 5 (1.0 oz./.050 lbs./20 g) and will provide stable readings under extreme conditions. 4. To return to the normal resolution mode, depress and hold the UNITS button until the enunciators stop flashing. WEIGHT MEASUREMENTS The unit may be used strictly as a weight scale.